This is my latest tea pot cake. I made all of my decorations with fondant a few days ahead of time. I baked a chocolate cake in the wonder pan that is mainly used for a doll cake. I held out a little of the batter and put it into a pyrex glass custard cup. This was for the lid of the pot. I cut the larger cake in half and filled it with a chocolate, mocha buttercream filling. To make this I used regular butter cream with two tablespoons of instant coffee and about a half of a cup of cocoa. First, I frosted the lid with white butter cream and then the large cake. I rolled out fondant that was homemade to fit onto the lid. Then, next I rolled out enough for the large cake. I covered the lid first and smoothed it out and brushed it with pearl luster dust. I then covered the large cake and did the same with it. I put the lid onto the bottom cake and decorated it with my fondant cut outs. I attached the handle and spout with a couple of toothpicks to help hold it onto the cake. I made some pearls for around the lid and did the rest of the decorations. You have to let the butter cream rest for about 20 minutes before putting the fondant on. WOW!!!! 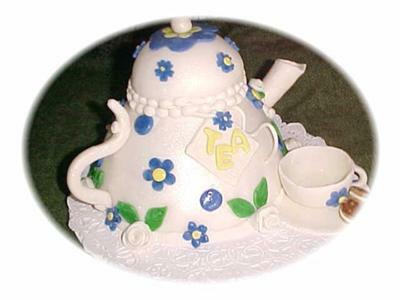 That is a beautiful teapot cake.I think you are very cleaver and talented.Nice job!!!! Nice color combination,and design.Excellent!!!!! Hi Nancy, I envy you how clever you are! It's too beautiful to be eaten. Well done. I LOVE IT, LOVE IT LOVE IT!!!!!!!!!!!!!! Your tea pots are getting BETTER AND PRETTIER every time!!!!! I love this! I collect teapots but I don't think it'd last too long in my house. Cake is pretty popular around here:) Can't wait to see more of your work.